The Obamas invited a couple thousand special guests to their backyard a week ago. By “special” I mean you had to be any old vagrant wandering around 1600 Pennsylvania Avenue on a Sunday afternoon. As long as you didn’t have a fear of park rangers or wide-brimmed hats, you could get free tickets from them. I suppose they did have some standards, because I didn’t see the man in Lafayette parked dressed as an aborigini stuffing a ticket into his loincloth. I believe the Obamas were out of town, which is the only reason I was able to wander this close to the Oval Office. 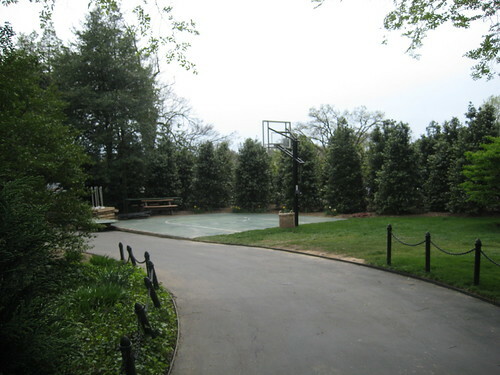 Or that I was able to glimpse the presidential basketball court, or rather half court. The Presidential swingset! 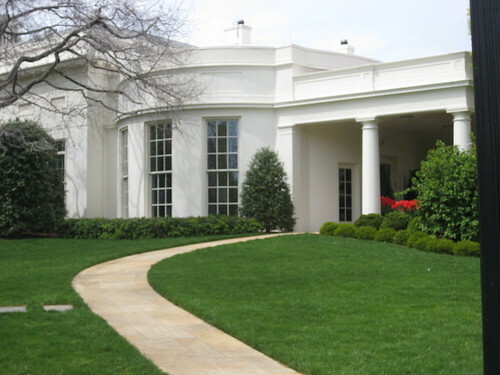 It really is within view of The Oval Office, just like they said on TV. I bet I could have gotten a good 3 or 4 feet towards the swings before that nice man in black tackled me to the ground and hauled me off for a full cavity search. You can view more photos from my trip in my Flickr set. Oh, I just checked the archives, and one of them, “How to build self-esteem” is not in there. (That’s the one of june 4). The other one, from august, is a future repost of your viking-guard! That is so cool! How is it that I live here in DC and didn’t even know about this. Bizarre… those photos look real, but the experience must have been surreal. Also bizarre was the ‘Take Our Survey!’ pop-up that I got when I clicked on this page. Are you doing surveys for World Peace or something? I’ve never been to DC, but May 20th my son’s 5th grade class is going, and I begged to chaperone so I could go! I can’t wait!! @Also Naantje – Yeah, I’ve been very busy lately and posted entries with the wrong dates. Your feed reader must have saved them before I updated them to the correct day. Not to get all English teachery on you, but your use of apostrophes is, um, wrong. The title of this should be “Hanging Out at the Obamas’ New Pad.” More than one Obama so the apostrophe goes after the s. In your first sentence, there should be no apostrophe. It’s just “The Obamas” plain and simple. People are so random about apostrophes but there are rules!!! I hit send before adding what I meant to add, which is that I love your writing and it’s only because I want the very best for your blog that I’m pointing out (very common!) grammar mistakes. BUMMER! 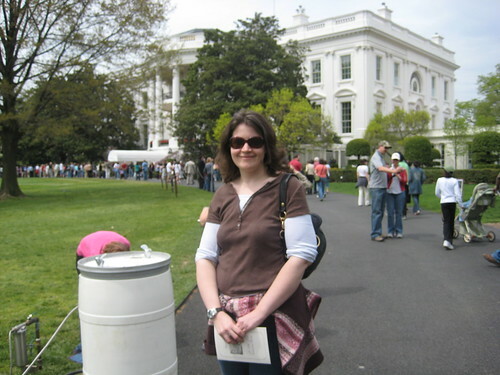 I wish that I had known/realized that you were in DC this past weekend … I totally would have found you for an autograph! Or coffee! In a non-stalkery way. Hope that you enjoyed the city! @Reyna – OK, fixed. Like I said in an earlier comment. I’ve been really busy lately, no lie. 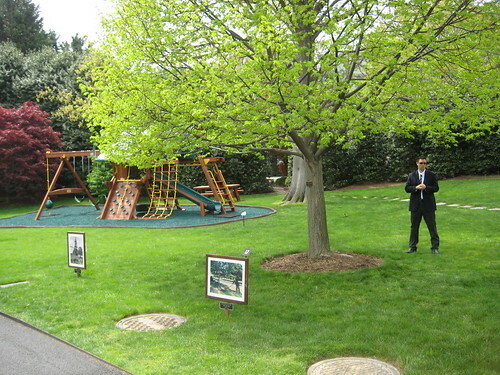 Very cool – I was there back when the Clinton’s lived in the WH…nice to see the youthful touches there! Y’know, I thought the very same thing (just like the West Wing) when I saw the oval office picture. 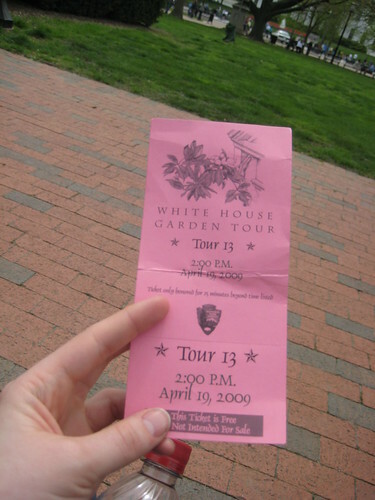 Looks like a great tour! That guy looks hot I might want him to tackle me! Wonderful pictures; thanks for sharing. Definitely not a fan of Mr. Obama as President but respect the office and all it stands for. Nice swingset. He must’ve gotten some stimulus money to be able to afford that. :) Oh, no, wait, WE paid for it! I am so happy for you, and for all the things you get to do, and appreciate you including all of US. As I looked at the pics of you, and noticed how nice you look…I got to thinking/wondering if you DO more now that you are thin. Would you have tackled this trip ‘back then’ ? Speaking of nice, you look cute in your shades, too. Is this the same camera? Or did you get one? It seems like it is working well for this type of shot. Maybe the other ones not being clear was due to the fact that someone else took the photos. You know, on a hot day, there’s nothing more refreshing than a icy cold glass of colonnade. Did you lose even more weight? Those self-portraits in front of the white house make it look as though you are thinner than I remembered from earlier photos. Not htat it matters, you’re an inspiration to me either way. Thanks for sharing your trip photos. Hey you know if I’d been paying attention I would have known you were going to be in town and I’d have made arrangements to take you out for lunch or something. Guess I’ll just have to bask in your awesomness from afar, next time maybe? Swingset? The only think I noticed in that picture was the ss guy. I think the Secret Service guy is hot! hehe.